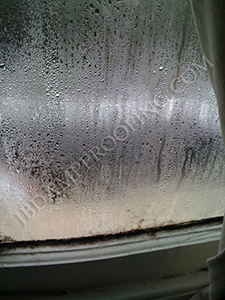 What is condensation and where does it come from? 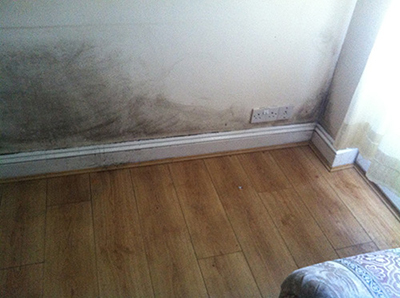 Condensation is caused by everyday modern living; central heating, double glazing, loft and cavity insulation. Add this to our everyday activities: showering, bathing, cooking, drying clothes in the home either by tumble dryer or hanging on radiators/airers and it also comes from every living person - it is estimated that one person alone emanates approximately 4 pints of moisture per night, then multiple that by the number of people living within the property. You cannot see this moisture as its absorbed into the indoor air until it meets a cold surface to condense onto. Most condensation occurs at night as the fabric of the building cools down. This can be seen on nearly every bedroom window first thing in the morning. The moisture-laden air condenses on the cool surface of the window thus causing streaming windows. Once we have condensation droplets, we find black spots appearing and this is the start of mould growth. It thrives on moist and humid conditions, it also thrives in dark unventilated places behind sofas, bookcases, bed headboards and fitted cupboards. This is not always noticed as these items are easy to pull out and check, so overtime the mould spores grows as moisture help it along it way, causing a vicious circle of repeating mould growth. 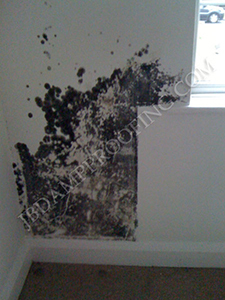 This growth is not only unsightly, it can deteriorate, and damage wall plaster and grow on furnishings, clothing, it has a damp odour smell and most worryingly it is well documented that it can be an irritant to people with allergies and breathing related illnesses like asthma and bronchitis. We have the answer to this ever-increasing problem. Many years ago, some specialists would advise adding ventilation vents to the property to alleviate condensation but as they caused a constant draft most people would cover them over or block them up. Another idea was to place a dehumidifier into the property to extract the moisture which does not ventilate a home, they draw out all the moisture within the air leading to dry throats/coughs. They are noisy, intrusive and very costly to run and need to be regularly emptied as the water chamber fills up. Now technology has moved on we can the solution by offering a large range of condensation control units for all types of properties including single room occupancy like student accommodations. We also offer extremely effective high powered kitchen, utility and bathroom extractor units. All our units are compact, whisper-quiet with running cost of an average light bulb, no day-to-day maintenance and no nasty water chambers to empty. Our most popular unit (for a 3 bedroom property) can be either wall mounted for properties without loft space, or loft mounted if you have loft access. Single occupancy rooms condensation units: ideal for student accommodations. Bathroom humidity sensor control extractor units; Every bathroom should have one fitted. Kitchen humidity sensor control extractor units. Every kitchen should have one fitted. Utility humidity sensor control extractor units. We supply and fit both residential and commercial units, for more information give us a call.